Well this explains why the sewer drain cleanout was left open. The old cast iron sewer vent that runs up the wall and through the roof has a 2' section that is completely rotted out. 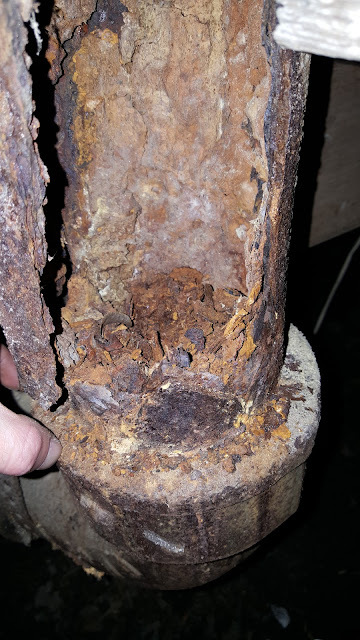 The previous owner had left the cleanout open to allow venting for the plumbing, since this pipe was blocked with debris, Not to mention it has a large gaping hole down the side of it. This will need to be repaired since the cleanout not only leeches nasty, smelly sewer gases, but also could cause a sewage backup under the house.